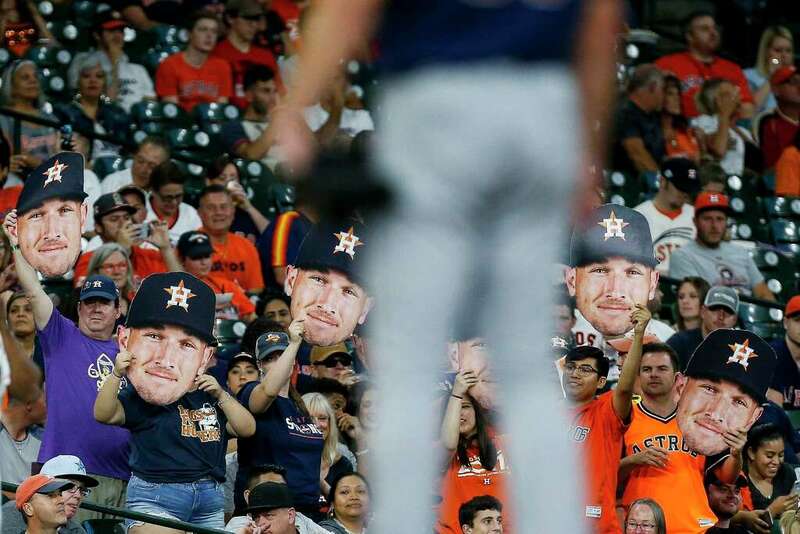 There should be no question at this point of the season who the Astros' MVP is this year. It's not Jose Altuve. It's not Carlos Correa. It's not George Springer or Evan Gattis or Dallas Keuchel. Clearly, 24-year-old Alex Bregman has been the team's best player and he's made this homestand his own personal showcase. No, he didn't hit a homer Tuesday night in Houston's 5-2 victory over Minnesota, but he did produce three doubles and two RBIS. According to Baseball-Reference, Bregman leads the club with a 6.4 WAR. His OPS is a team-high .944. He's likely to reach 30 homers and 100 RBIs and leads the league with 46 doubles. Bregman's two-bagger to left in the first drove home the first Astro run and his double in the seventh plated the last Houston tally. In between, Tyler White singled home Bregman in the first and Yuli Gurriel drilled a two-run homer to cap a four-run first that produced a lead that was never threatened. If anyone else could enter the team MVP argument, it would be Justin Verlander who became the first Astro to 14 wins as he tossed seven innings and gave up just one run on three hits while striking out eight. Verlander is second in WAR on B-R's chart and he dropped his ERA on Tuesday to 2.73 while his WHIP shrunk to 0.94, meaning he allows less than one baserunner per inning. He was masterful for the first two months of the year and had some hiccups in midseason but seems back on track for the stretch run. Speaking of which, the victory insured the Astros will keep their 2-1/2 game lead over Oakland regardless of the final score on the coast. Should the Athletics' lead over the Yankees Tuesday hold up, Houston will have pulled into a tie with New York for the league's second-best record behind Boston. The A's could possibly overtake the Yankees as well and could end up hosting New York in the one-game Wild Card game in October. You can imagine the gnashing of teeth in Gotham should that happen. But I digress. How low are the Twins? Their cleanup hitter Tuesday was Robbie Grossman. Yes, THAT Robbie Grossman who obliged with an RBI double off Verlander in the third. Minnesota's DH for the night was batting .202. The downside of the night was the return of Chris Devenski who came on in the ninth. He allowed a solo homer to Jorge Polanco then a walk before A.J. Hinch came out with the hook. Roberto Osuna finished up with his 13th save. Houston brought up two more players from the minors Tuesday as the September rosters are allowed to expand. Infielder J.D. Davis returns while righthanded reliever Dean Deetz is joining for his first coffee cup in the majors after posting a 0.89 ERA at three minor league levels this year. The homestand closes Wednesday night with a 7:10 pm Central finale. Old nemesis Jake Odorizzi (5-9) takes the hill for the Twinks against lefty sensation Framber Valdez (2-1) who carries a nifty 1.26 ERA into play. Odorizzi has a career record of 3-0 with a 0.72 ERA in four starts against the Astros.